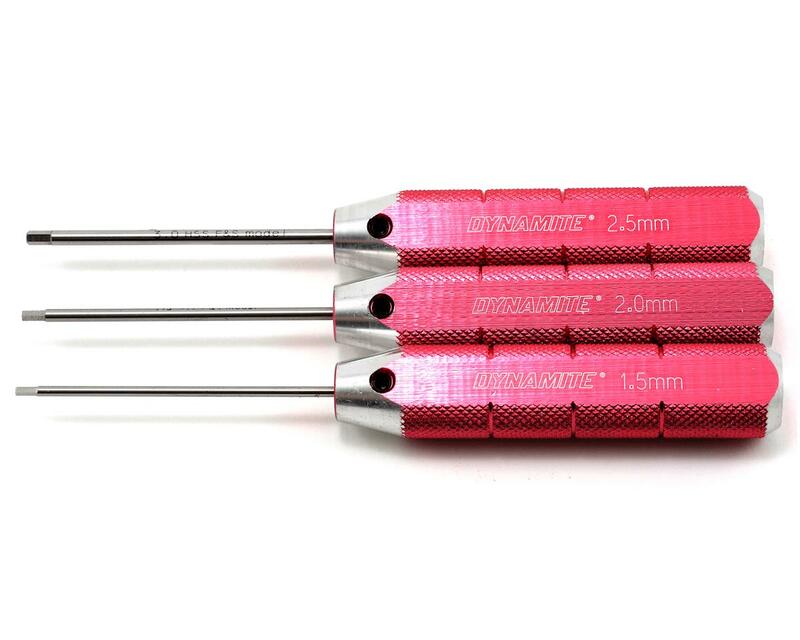 This is a set of three Dynamite Metric Machined Aluminum Handle Hex Drivers. These hardened steel-tipped tools will last a long time. Their comfortable-grip red anodized handles are flat on one side so they won't roll off the workbench. Replacement tips are available in all sizes. I have owned so many sets of tools over the years. These low cost Dynamite tools have outlasted and out performed them all !! Not sure what they did but the tips are the perfect hardness to last a really really long time without rounding and not have a tenancy to chip or break off to easily from being too hard. 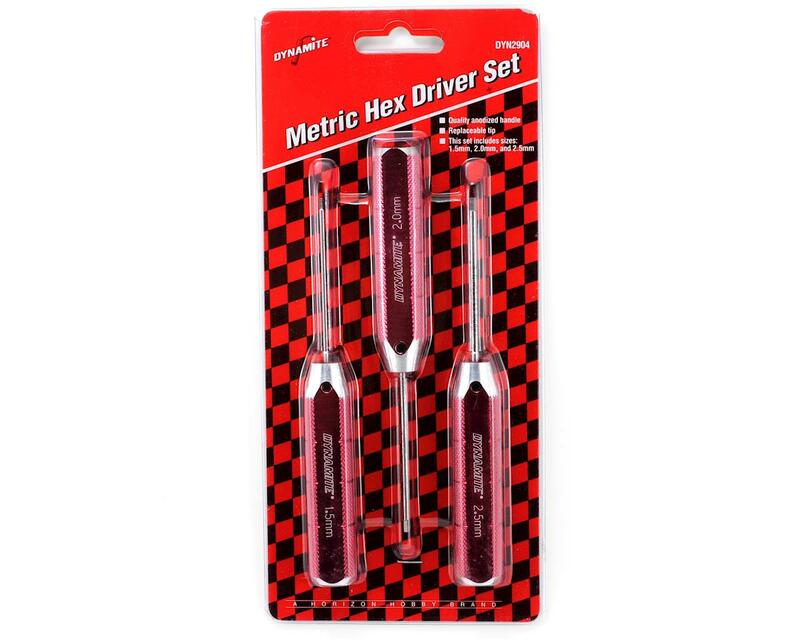 This was the first "real" hex driver set I ever bought in RC. I got them at my LHS because they were reasonably priced and Ive had them for years now. Since then, I have bought a few different sets of "high end" tools that cost alot more than these and none of them have been as durable. I have a full set of Hudy tools and full set of Protek tools on my workbench and I still reach for these as my go too set. The tips last, the handle has great grip for getting those stubborn screws broken loose, and they have a nice flat on them to keep them from rolling off the bench!! The only way they could be improved is if the shafts were just a little bit longer for getting into some of the hard to reach spots. Still, if I had only one set of hex tools these would be the ones!!! Highly recommended. Bought a set of these today from my LHS after wasting money on the DYN2819 set. These are worth the extra ~6 dollars. You will not be disappointed. Very good kit. Well made and very tough ! I used it the whole season and they are still like new. I bought these from my hobby shop over 10 years ago. I use pliers to hold on to them and turn stuck screws. They are tough. These are very good and decent quality drivers! Especially given their price they are absolutely worth the money and are a very good product! I did not purchase these wrenches from Amain, but since they have been so excellent, I wanted to write a review. First of all, the price is incredibly low for how high quality these are. I've made an entire AE B6D kit with them and none has failed. They are very strong. The handles have a nice weight to them, and they are solid. Only one downside is, the texturing on the handles can be uncomfortable, but it depends on your hands. I personally wrapped mine in grip tape. Buy these, they are wonderful (: Have a good day! I like matching tools and these are great. They are not the cheapest or the most expensive. The hex stays a hex, i have yet to strip one like I have with the cheaper sets. These could be longer but they are ok. I purchased this set from my LHS atleast 11 years ago. Finally the 1.5mm broke - so I will be buying another set to replace mine. Very happy with the durability and longevity of these tools. This is a solid tool set well worth the money. I bout one of those cheap sets and was expecting something similar but, these are superior even to my lowes hex wrench set. They fit, quality steel, they are definitely professional quality. Saves me from stripping out m3 hardware, especially the button heads. I purchased these from my LHS about 3 years ago, and they still perform flawlessly. I would recommend these to anyone. I've had all types of tools from various brands and these are the best. The tips are very precisely cut and ultra strong. With one side being flat, it won't roll off tables. Can also be used as for tweak blocks in a pinch with a TC as they are all the same thickness and the flat side makes them ultra stable on a pit board. Great product.